To open new opportunities for minorities State Government is planning to create a Corpus Fund of Rs. 2 crore, in which they will be get technical and vocational training. This was stated by Prem Kumar Dhumal, Chief Minister while speaking in the meeting of BJP Minorities Morcha organised at Mandi today. Chief Minister said that State Government was committed to protect the interests of monitories and help them to uplift their social and economic status. He said that the proposed corpus for skill up-gradation of minorities children would go a long way in getting them equip with vocational and other vocational education. He appealed to the corporate sector to honour their corporate responsibility and contribute liberally towards the fund so that maximum children of minorities could be helped in skill up-gradation. 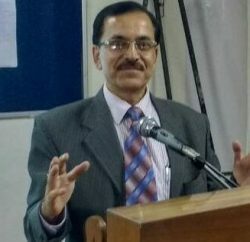 He said that State Government proposes to increase the corpus to Rs. 10 crore so that out of the interest of the fund, scholarship could be awarded to the eligible minorities children in their higher education. Prof. Dhumal said that State Government had constituted Minorities Development Finance Commission to provide liberal finances at low rate of interest to help them adopt different employment and self-employment avocations. He said that Commission was adopting liberal attitude towards the financial needs of the minorities applicants and disposing off the same in a time bound manner. He said that State Government had also allowed free travelling facility in HRTC buses to women of Muslim community on Id and Bakr-Id festivals besides public holidays to the working Muslim women on both the festivals. He said that it would be at par with other women who had been provided free travelling facility in HRTC buses on Raksha Bandhan and Bhaiya Dooj besides public holiday on Karva Chauth festival to working women. Chief Minister said that it was during the BJP regime that discrimination with minorities was removed and they were provided added facilities and opportunities to progress economically and socially. He said that minorities were finding themselves safer and secure under BJP regime since added attention has been paid towards their development. Prof. Dhumal detailed various activities being undertaken by the State Government for socio-economic upliftment of minorities and said that BJP Government had been extending due respect to all the communities in the society with a view to strengthen the social system for complete harmony and unity of the country. Tanveer Ahmed, National President BJP Minorities Morcha thanked the Chief Minister for the policies and programmes formulated by the State Government for the betterment of minorities. 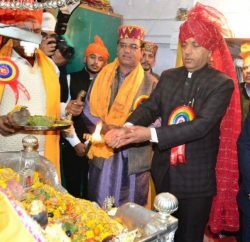 He said that Himachal Pradesh happened to be one of the few leading States which had extending all possible help to the minorities which was resulted into winning their trust. He said that BJP was ruling in seven States in the country and Himachal Pradesh had been one the leading States among them. He said that benefits of development were also being ensured to the minorities which was a great step towards economic empowerment of the minorities. He appealed to the minorities to work dedicatedly for the party. Ravinder Singh Ravi, Irrigation and Public Health Minister, Satpal Satti, President, State BJP, Dile Ram, MLA, Akram Hashmi, General Secretary, National BJP Minorities Morcha, Mureed Husain, Chairman, Minorities Welfare Board, Mohammad Raj Bali, President, State BJP Minorities Morcha, other office bearers of Morcha were also present on the occasion.